Artist Unplugged: Happy St. Patrick's Day! A very quick sketch to commemorate today! F.Y.I. No dress success yesterday.......only one did she find that she liked but it was over the budget. Three trips, seven stores locally, next, we will venture out of town, time is ticking away. Hope everyone has a wonderful day!!! Haw and Happy St Patty's Day. I hope you and the beast had a great day. I remember my proms. I made the dress I wore to my junior prom, and I wore a bridesmaid's dress (leftover from a friend's wedding) to my senior prom. Such fun. I think shopping for one these days would be much more difficult. Good luck! 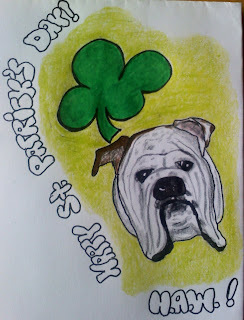 Love your St. Paddy's sketch. happy st pats day to you too, belated. and to apollo of course. i bet if he went with her, he would 'sniff' out a good dress immediately. poor you mom!